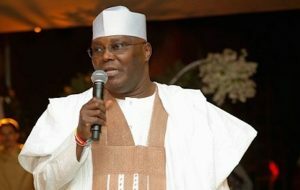 The Presidential election tribunal has granted leave to the Peoples Democratic Party and it’s presidential candidate, Atiku Abubakar, to serve court processes on President Muhammadu Buhari and the All Progressive Congress by substituted service. The processes are to be served on the president through number 40 Blantyre street off Aminu Kano Cresce nt Wuse 2 Abuja, being the national secretariat of the APC. Counsel to the PDP and its presidential candidate, Chris Uche while moving the experte motion asked the appellate court to grant the request on the ground that it has become practically impossible to reach the president for personal service. Uche also informed the court that it is in the interest of justice that the request should be granted. The experte application was predicated on seven grounds and seventeen paragraph affidavit as well as another further affidavit of five paragraphs. In his ruling, the lead judge of the three-man panel justice Abdul Aboki said that the court granted the request of the petitioners in the interest of justice. Consequently, the court ordered that Buhari, being the second respondent in the petition be served with the petition through any of the senior officials of the All Progressives Congress. Alhaji Abubakar filed the petition on the 18th of March to challenge the declaration of President Mohammadu Buhari as the winner of the February 23rd presidential election. He asked the tribunal to declare him as the winner of the presidential election having scored the majority of the lawful votes cast. In the alternative, he and his party are asking the tribunal to annul the election that returned President Buhari as president and order INEC to conduct a fresh election. No date has been fixed for the hearing of the petition on the grounds that main respondent that is the president has not been formally served with the petition as required by law.